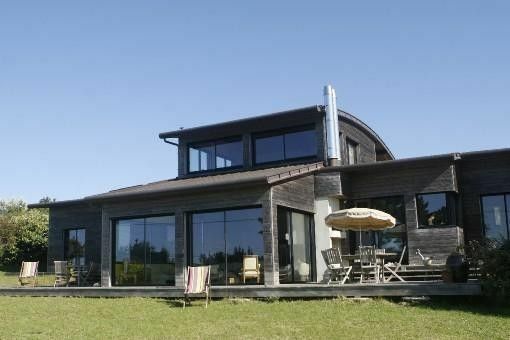 Wooden architect house of 200m2 with stunning sea views, bright, spacious, ground floor, south facing, with large terrace, garden and garage (ping-pong, table football and bicycles). Our house is located 150 m from the sea. It is located along the coastal path, in a dead end. The neighborhood is calm. All living areas of the villa are south-facing and offer sea views. Thanks to the large glass doors and sliding doors, the house is very bright and can enjoy the view from the outside or inside on the entrance of the Brest Gully, the peninsula of Crozon, the tip Raz and all the boats that sail. The villa is surrounded by a 1000 m2 garden, located to the south, with a large terrace, garden furniture and a barbecue. The house has been designed in a contemporary spirit: wooden structure, mostly ground floor, with large windows. On the ground floor you will find: A large living room of 80m2 gathering living room, dining room and kitchen. The kitchen is well equipped and has all the necessary equipment: Gas hobs, fridge / freezer, multifunction oven, microwave oven, dishwasher. Always on the ground floor, on a wing of the house, a "suite" with bed 160x200 and ensuite bathroom. Finally, on the other wing of the house, 4 smaller rooms for the youngest and a bathroom with a bath and a walk-in shower complete the visit! On the floor a big room to live, or to sleep, of 36m2, with a double bed. Finally in the basement, a large garage, with ping-pong, table football, bicycles ... and a laundry room with washing machine and dryer. Sea side. Beautiful family resort marked by the authenticity of its small Breton village Plougonvelin is located on the tip of Brittany, opposite the Iroise Sea. Breathe in the sea air: you are at the end of the world! 3 beaches are within walking distance in 1 to 10 minutes. In a quiet, relaxation, rest, well-being, you will have all the elements for a successful stay in Brittany.